In an earlier post, I mentioned that trouble was brewing for Carolina Kostner who may have helped an ex-boyfriend avoid a doping test. Recently, it has been revealed that Carolina has been banned from competition for 16 months but according news sources (here and here), she will be appealing the decision in the Court for Arbitration for Sport. The ban ends on May 15, 2016 but it does not prevent Carolina from participating in skating shows. Theoretically, it also means that Carolina could compete at the 2018 Pyeongcheng Olympics, though whether she wants to or would be competitive enough to win a medal is a completely different question. Overall, other than being a detriment to her brand and image, I don’t think this ban will affect Carolina’s career or ladies’ figure skating too much. Still, I hope the truth comes out and everything is resolved for the sake of sportsmanship. What do you think of Carolina’s situation? Who is the mystery figure skater? Hello darling readers! I realize that by now, my GPF post is super super late and I apologize again. I’ve been working on a few things not related to this blog in my spare time and I admit that it’s been preventing me from posting too much. For now, I’ll offer this short post asking you for some sleuthing skills. I was listening to some Japanese music recently and I came across this song and music video. Does anyone know who the skater is? Edit: Thank you, my wonderful readers!!! The figure skater in the video is Chika Suguri, sister to Fumie Suguri. Chika looks as if she has some pretty decent technique but I guess she’s not prominent in the competition circles. Let me know if you know! For the longest time, I couldn’t quite take Machida seriously thanks to his Firebird program. The flapping bird-like motions were perhaps part of his interpretation of the music but it was also so cheesy. And cringeworthy. I was almost suffering from secondhand embarrassment from watching it. 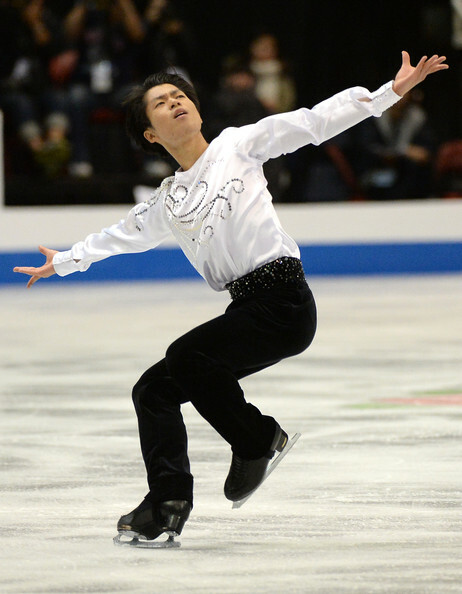 However, I really began to respect Machida and what he was trying to do when I fell in love with his East of Eden program. The choreography was lovely and although the interpretation was a little overwrought, at least he was trying and being true to himself. In the end, I kind of accepted Machida’s attempts at being an artiste. He was like that kid in drama class who overacted and couldn’t naturally create a character that blended seamlessly into a story but at least he tried and kept trying to improve himself. And for that, I have to give him a ton of respect for putting himself out there. Good luck in your studies, Machida-san. I’ll miss your exuberance and artistry on ice. Hello all my wonderful readers! I apologize for the lateness again on my GPF recap post. The holidays are over and I’m feeling pretty decently rested so I’ll get working on it soon enough. I will once again ask you for your patience as both my work and social obligations are ramping up. Nonetheless, I will start off the new year with a post on an up and coming skater. Unlike my “The Future” posts, which I have only created one so far, this is just a post on an exciting young skater. For 2015, the youngin’ I’ve chosen to feature is Evgenia Medvedeva, who won the Junior GPF this year. She is an interesting performer but I’m not sure if she’ll survive puberty. What really intrigues me for this program is how back-loaded it is. (How very different that is from the programs from the 2010 Vancouver Olympic cycle…) I wonder if this is a sign for things to come. Here’s to another wonderful year with all of you! Happy 2015~!